BERNARD “THE ALIEN” HOPKINS VS. BEIBUT SHUMENOV LIGHT HEAVYWEIGHT WORLD CHAMPIONSHIP UNIFICATION TO TAKE PLACE SATURDAY, APRIL 19 LIVE ON SHOWTIME® FROM THE DC ARMORY IN WASHINGTON, D.C.
Tickets On Sale Today at 10 a.m. ET! WASHINGTON, D.C. – Washington, D.C. is known as a city where history is made. On Saturday, April 19, another historic event will take place in the nation’s capital when IBF Light Heavyweight World Champion Bernard Hopkins faces WBA World Champion Beibut Shumenov in an attempt, at 49-years-old, to become the oldest fighter in boxing history to unify world titles. The DC Armory, the site of several championship boxing matches in the last year, will host the return of the future Hall of Famer to the capital for the SHOWTIME CHAMPIONSHIP BOXING® main event (9 p.m. ET/PT delayed on the West Coast). In the co-main event, popular undefeated WBO Middleweight World Champion Peter “Kid Chocolate” Quillin defends his title for the third time when he meets WBO European titleholder and former interim WBO Junior Middleweight Champion Lukas Konecny. Quillin has been one of boxing’s most exciting competitors over the last few years; scoring 11 knockdowns in his last three title fight wins. In Konecny, he will be in the ring with a crafty and experienced veteran, a former Olympian who has never been stopped. Tickets priced at $25, $50, $75, $200 and $300, plus applicable taxes, fees and services charges, go on sale today at 10 a.m. ET are available online athttp://www.ticketmaster.com, all Ticketmaster locations or by calling (800) 745-3000.The DC Armory Box Office will be open on fight night only from 3:00 p.m.-10:00 p.m. ET. The legendary Hopkins made his first attempt at a world title in Washington, D.C. in 1993 when he lost to Roy Jones Jr. at RFK Stadium, just steps away from the DC Armory. A year later, he faced Segundo Mercado in neighboring Landover, Md. 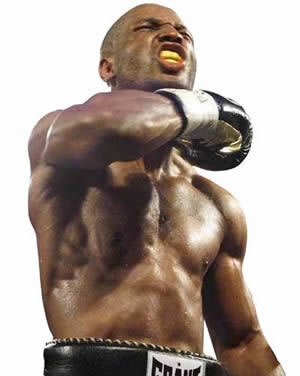 and won the IBF middleweight world title, which he held for over a decade. Boxing’s elder statesman, Bernard “The Alien” Hopkins (54-6-2, 32 KOs) continues to achieve remarkable goals in the world of boxing-and has done just that since turning pro in 1988. But he has amazed even more with his exploits over the last few years, as he twice became the oldest man to win a major world championship in the ring. Now 49-years-old, the pride of Philadelphia, Pa., had one of his best years yet in 2013, defeating Tavoris Cloud in March to win the IBF Light Heavyweight World Championship, and then successfully defending his title in October with an exciting win over Karo Murat. OnApril 19, the future Hall of Famer returns in an attempt to unify the 175-pound title. Additionally, as a partner in Golden Boy Promotions, Hopkins has undertaken out-of-the ring promotional duties that further solidify him as one of the most recognized and revered figures in the sport. A native of Shymkent, Kazakhstan who now fights out of Las Vegas, 30-year-old Beibut Shumenov (14-1, 9 KOs) made his way to the top of the light heavyweight division with lightning-fast speed, winning his IBA title against Byron Mitchell in 2009, in just his eighth professional fight before adding the WBA title by defeating Gabriel Campillo two fights later in 2010. Since then, Shumenov, a 2004 Olympian for Kazakhstan, has successfully defended his title five times, defeating Vyacheslav Uzelkov, William Joppy, Danny Santiago, Enrique Ornelas and Tamas Kovacs. But this April, Shumenov gets his opportunity to make a name for himself in the history books if he can defeat Bernard Hopkins. Peter “Kid Chocolate” Quillin (30-0, 22 KOs) has gotten his reign atop the 160-pound division off to a rousing start with a decision win over Hassan N’Dam for the WBO crown in October of 2012, then going on to successful defenses twice with stoppages of Fernando Guerrero and Gabriel Rosado. Now ready to take on the challenge of Konecny, the 30-year-old boxer-puncher–who also owns wins over Winky Wright, Craig McEwan, Jesse Brinkley and Fernando Zuniga-is eager to begin his 2014 campaign with another knockout victory. A five-time National Champion for the Czech Republic who also represented his nation in the 2000 Olympics, 35-year-old Lukas Konecny (50-4, 23 KOs) will make his United States debut on April 19 after years of fighting Europe’s best. Konecny plans on making it a memorable visit as he challenges for the WBO Middleweight World Championship. A former interim WBO Junior Middleweight Champion, Konecny made a permanent move to 160 pounds in 2013, and after winning the WBO European Title with a win over Karim Achour and successfully defending it by defeating Moez Fhima, he put himself in line for world title honors against Quillin. Hopkins vs. Shumenov, a 12-round fight for the IBF, IBA and WBA Light Heavyweight World Championship, will take place Saturday, April 19, at the DC Armory in Washington, D.C. The event is promoted by Golden Boy Promotions and sponsored by Corona and AT&T. The live SHOWTIME CHAMPIONSHIP BOXING telecast will begin at 9:00 p.m. ET/PT (delayed on the West Coast) and will be available in Spanish via secondary audio programming (SAP). For more information, visit www.goldenboypromotions.com and www.sports.sho.comand follow on Twitter at @THEREALBHOP, @KIDCHOCOLATE and @SHOSports, follow the conversation using #HopkinsShumenov and become a fan on Facebook atwww.facebook.com/GoldenBoyBoxing and www.facebook.com/SHOBoxing.